COLD SPRING SHOPS. : ILLINOIS IS A GOOD PLACE TO BE FROM. The Center for Governmental Studies at Northern Illinois University reports that Illinois leads the way in outmigration during 2013 - 2014. Illinois may be the most populous of the six states (Illinois, West Virginia, Connecticut, New Mexico, Alaska and Vermont) that had out-migrations, but their net out-migration of 9,972 people might be the largest as a share of state population. Retrieved from Northern Illinois University Newsroom. With ten thousand cases and fifty destinations (including the District of Columbia) it's difficult to generalize about why people leave. Taylor said declining birth rates and an aging population also contributed to Illinois’ net population loss from 2013 to 2014. California and Florida may remain popular as retirement destinations. 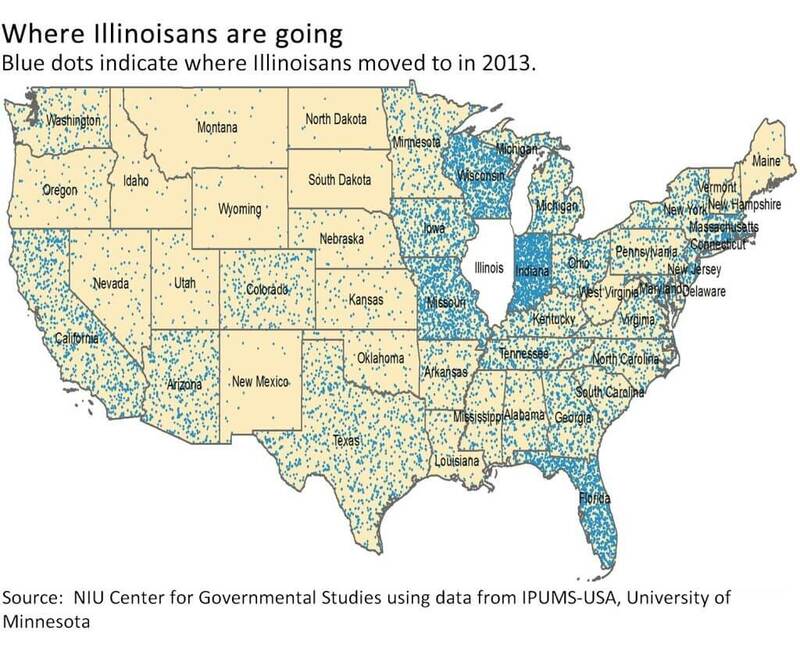 And the Illinois Policy Institute, no fans of the blue social model, are unsparing in their assessment of Illinois outmigration. Illinois has a domestic migration problem that is verging on a crisis. Illinoisans are increasingly voting with their feet against the state’s status quo by moving to other states, and taking their jobs and tax dollars with them. In 2014, 95,000 more people left Illinois for other states than moved to Illinois from other states – an all-time record high. This was a massive no-confidence vote in the state, capping off a net loss of 675,000 people in the last decade and 1.36 million people in the last two decades. That "massive out-migration" story is incomplete. Apparently the reconciliation of 95,000 with 10,000 involves some 85,000 births in Illinois. And people are moving into the Chicago area, the Combination's failures notwithstanding. But it's still cheaper to rent a trailer to move to Chicago than to rent one to move out. There was far more demand to leave Chicago than to enter Chicago in 2014, as reflected in rental prices for moves between the cities. For example, looking at rentals between Chicago and Indianapolis for July 2014 shows there was massively more demand to leave Chicago for Indianapolis than to leave Indianapolis for Chicago. That demand was reflected in a higher price to drive a U-Haul truck from Chicago to Indianapolis than vice-versa. It cost twice as much to drive a large U-Haul truck from Chicago to Indianapolis than from Indianapolis to Chicago. Rental rates are equal at Chicago for or from Los Angeles, two cities that used to be popular destinations but both rendered less habitable by Democrats.